Lines from Linderhof: It May Have Been President's Day But To Me -- It's Still George Washington's Birthday! 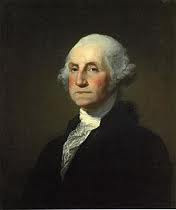 It May Have Been President's Day But To Me -- It's Still George Washington's Birthday! When did George Washington's Birthday get moved from February 22 to the third Monday in February? In 1968. Congress enacted the "Monday Holiday Law" -- changing many holidays to a Monday thereby insuring that Federal employees would get three day weekends for most holidays. Interestingly, we lived in Kansas City and the first time that Washington's Birthday was changed from the true date to a Monday, we got the Monday off and then on the day itself, there was such a snowstorm that most of the city was closed. I think George had "someone's" ear and wanted to insure that his real birthday was still a holiday!!! When did Washington's Birthday become "President's Day"? Contrary to popular public belief, neither Congress nor any President has ever stipulated that the name of the holiday observed as Washington's Birthday be changed to "President's Day". It's the Merchants and the Media who've changed the name. 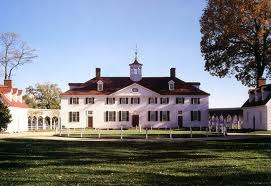 After Congress passed that legislation, moving Washington's Birthday to the third Monday, it will NEVER be celebrated on his real birthday -- for the third Monday will never be past February 21 -- and as everyone knows, Washington's Birthday is February 22! We had it so often on February 22, that we should have called it "Washington Pie"
And cherries are forever after thought of when one thinks of Washington! I've made my share of Cherry Cheese Pies. It was tradition, after all! Warm from the oven, it's a great breakfast cake. Leftovers make great tea fare. Heat oven to 350. Grease and flour a 9 inch springform pan. In a large bowl, beat the yolks with 1/2 the sugar, the vanilla and the lemon zest. In another bowl, beat the whites with the salt to soft peaks, then beat in the remaining sugar a tablespoon at a time until thick and glossy. Stir the almonds into the yolks, then the cherry brandy, then loosen the mixture by adding a spoonful of the whites to the mixture. Fold in the remaining whites and pour into the prepared pan. Scatter the cherries over the top and bake for 45 minutes or until a toothpick in the center comes out clean. Let cool 10 minutes before removing sides of the pan. Serve warm or at room temperature. It's Friday and I'm sharing the cherry cake with Michael at Rattlebridge Farm for Foodie Friday. Even Canadians know who George Washington is and that he chopped down a cherry tree. :-) The rest I was not aware of. When the cherries come in, I just might try your cake Martha. I've made that cherry dessert many times. Initially it was served at a 4-H club meeting I went to; I HAD to have the recipe after that. 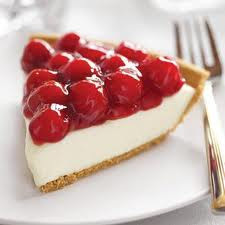 I know it's not a true cheesecake, but we always called it a cherry cheesecake. It is indeed a delicious dessert. Your cake looks good too, Martha. Have a great wknd and stay warm! Your cake looks wonderful. I hope you are doing okay with all of the snow your area is getting! I don't know about this one, dear friend!! !New York Style Cheescake has to be my ONE most favorite dessert EVER!!! Guess I'll have to give your cake a try for comparison!!! I grumble every year that we don't celebrate Washington's birthday! 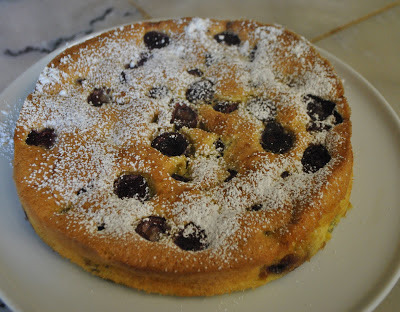 You have inspired me to commemorate the day by making your cherry cake today. I am going to the store and am certain there will be no fresh cherries, maybe a can will work? I like that it has no flour, I am gluten free and am always looking for something to make for a treat. Of course our washer sprung a leak a few days ago, and the house is in turmoil, so perhaps I can be forgiven for forgetting this time. This time. It's day 2 of not being able to get out of our street, but as I'm sitting here catching up on your always delightful posts, we just saw the snow plow one street over! =) Hope you are doing well, drinking lots of tea and enjoying all the snow! I'm making your coffee cake this weekend...thanks for always sharing your wonderful recipes. Enjoyed all the photos of your books. Your house is so pretty.